This architecturally-seductive setting is home to the bold French fare of chef-owner Jean-Pierre Vigato. 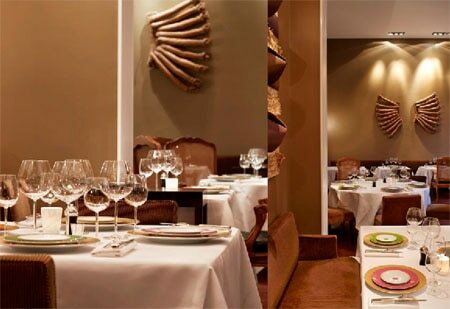 : Jean-Pierre Vigato, chef and owner of Apicius, has settled close to the Champs-Elysées in a private mansion that dates from the early eighteenth century. The façade's classical architecture looks out onto a vast private garden. To the left of the foyer, original paintings adorn the ceiling above a large modern bar. The different rooms are refurbished but well preserved, and are connecting, maintaining intimacy. The décor by Eric Zeller is original and timeless with the use of subtle colors and harmonious volumes. Vigato presents some audacious dishes and as always bistro fare and bourgeois cuisine are cozy neighbors. Both reach upwards with refined preparations, as in the lobster millefeuille, the langoustine prepared in three ways --- shelled and roasted, like a tartare with garlic, and as a tempura stuffed with green peas; calf sweetbread with chicken sauce; and a vanilla soufflé with raspberry sherbet. Add to this menu a Viré Clessé Quintaine 2010 from Guillemot-Michel and you’re in for an unforgettable meal. Reserve at least two months in advance.